Want to be the next Evel Knievel but not risk serious injury? In Mountain Sheep’s Bike Baron for the iPhone and iPad, you get to indulge your reckless streak as a motorcycle daredevil who frequently attempts outrageous and dangerous stunts. By the end of the game, you should become an expert motorcycle stuntman, capable of conquering any ramp, jump, or loop. However, to vault to that level of expertise, you will have to exercise a great deal of patience and be willing to practice, practice, practice. At the start of each of Bike Baron’s 50-plus 2D side-scrolling levels, you will find a mustachioed, leather jacket-wearing man on top of a motorcycle, getting ready to conquer an obstacle-ridden track. (A small chubby cat accompanies the rider, which I can only assume is a good luck charm.) You will also find the game’s touch controls at the bottom of your screen, which make your motorcycle go forward, backward, and tilt. Born to Be Wild: The Bike Baron performs another death-defying stunt on an obstacle-ridden track. I found Bike Baron’s controls to be very responsive—and that’s good because the game demands a certain level of precision. Tracks tend to offer a variety of large and small loops, long and short jumps, and steep and slender ramps. Levels are also littered with objects that can either help or impede your progress, such as rocket boosters and explosive barrels. As you advance through the game, it becomes harder to overcome those obstacles—certainly, it’s a challenge to do it in one try. Fortunately, levels usually have save points before their difficult obstacles, so if you fail to overcome a particular roadblock, you’re not going to erase any level progress made before them. Though conquering obstacles is an important aspect of Bike Baron’s levels, doing so is not the only goal. All levels have three objectives that you must achieve, and these objectives change from level to level. Sometimes you have to collect gold coins laid out along obstacles; other times, you have to finish a course without any accidents or you must complete a level within a certain time. Because of that, the levels are designed for repeated plays, as you try to meet each of the objectives. And while many of Bike Baron’s levels have enough twists and turns to still make them enjoyable after three attempts, there are more than a few levels where I wish the three-attempt rule did not apply. If you have trouble conquering the obstacles of some levels, you’re likely going to end up hating the three-attempt rule. If you do grow tired of some of the game’s existing levels, I highly suggest you try Bike Baron’s level maker. It’s very intuitive and lets you design levels for the game that are as visually interesting and as architecturally complicated as the ones that come with the app. The game’s textures and settings look great, so even an amateur level maker can whip up a visually appealing track. 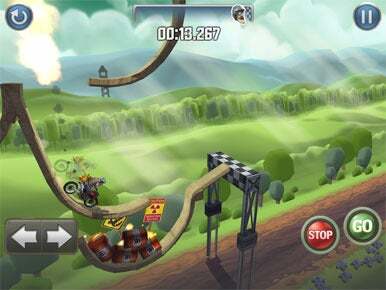 Bike Baron is not for people who hate repetition, but it is a well-made game that is challenging from start to finish.